Thank you very much the many masterpieces submitted to the JET WORLD FESTIVAL 2019 PHOTO CONTEST. You can find the photos at the webpage below. 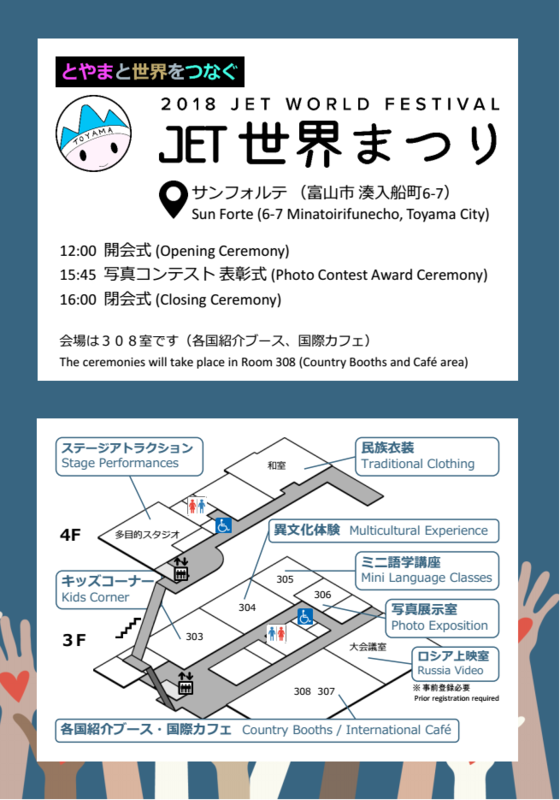 The JET Festival 2019 information page has been updated. Thank you very much for all the masterpieces submitted for the JET WORLD FESTIVAL 2018 PHOTO CONTEST. See the photos at the webpage below. Unfortunately we have found some lost and found items. The list is at the following webpage, please contact us. Thank you very much for the all your efforts, from the yesterday’s preparation, to today’s operation and cleaning. I know it had some issues from the Committee, but thanks to all you volunteers everything run fine, and the results are above expectations. however due to the large number of volunteers, for now, please forgive and let me express my gratitude through SNS/email. 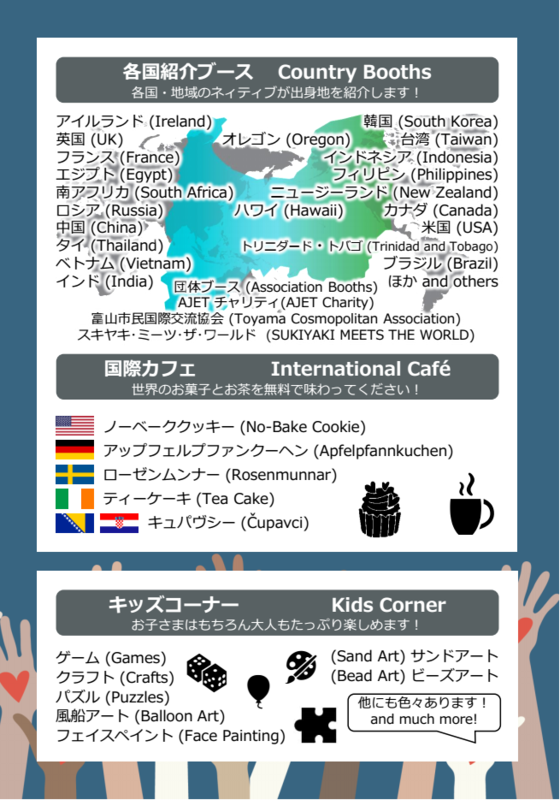 Although it was so busy today, it would be great if through the JET WORLD FESTIVAL you were able to meet several kind of people and make friends and connections. Representing the AJET and the JET WORLD FESTIVAL EXECUTIVE COMMITTEE, I would like to express our sincere gratefulness. 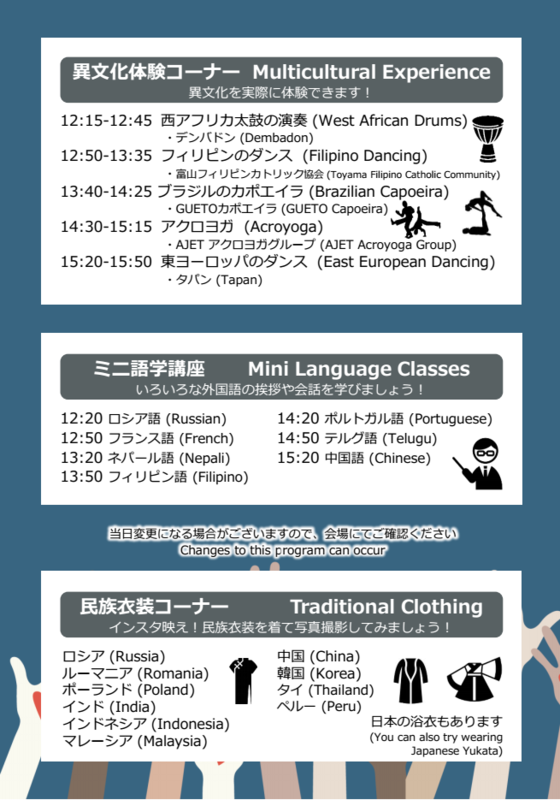 The JET WORLD FESTIVAL is an annual event, and happens in the middle of February. Thank you very much again, and we are looking forward to see you again. 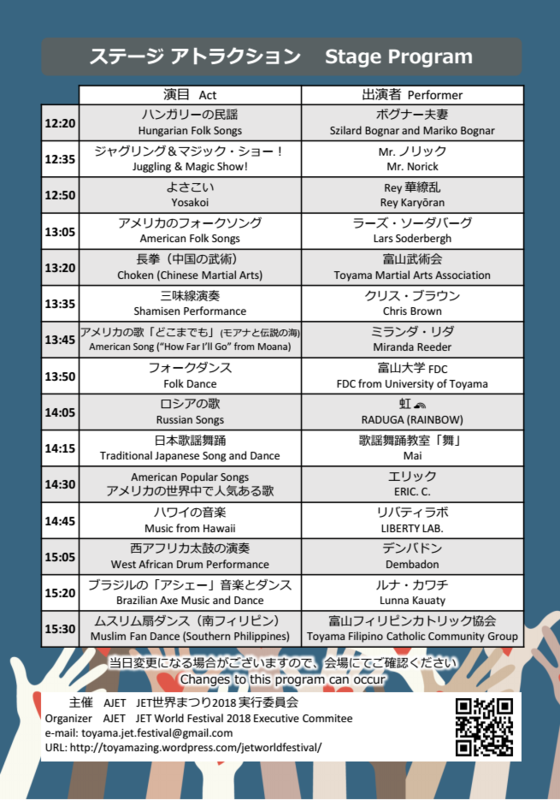 JET WORLD FESTIVAL 2018 Program is available! We are looking for Volunteers to help with preparations and management of the Festival. Attraction performers and booth presenters are also welcome.